Blackjack which is also known as Twenty-one is one of the most popular games in casinos all over the world. The causes of such popularity are: simple rules and easy strategy. The main goal of Blackjack is to collect cards with the total amount of points no more than 21, if this amount exceeds, player will lose the game. The more the amount of points, the more is the value of gathered cards. According to rules of blackjack, 6 or 8 card batches are used for playing the game. There are also some special blackjack tips and strategies can be found to help you winning. Face cards (king, jack, queen), which are also called 10's have 10 points, aces according to the wish of gambler may have either 1 point or 11, all other cards are valued due to their rank. 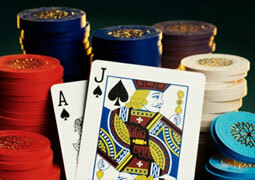 Ace and 10's, however, are considered as the most valued combination, which is called Blackjack. The quantity of players is limited by so called "boxes" - rectangles, drawn on the table. Gambler can stake both on one or several boxes, but the amount of rates shouldn't exceed established maximum. All gamblers play separately, but against dealer. In the beginning of game each gambler makes his bet with the help of chips. Croupier starts to distribute cards among gamblers, one he take for himself. At the beginning each gamer has two cards, if combination is not gainful, gambler takes more cards. If player goes over 21 points, he loses his bet. Due to rules of blackjack, as opposed to gambler, dealer acts automatically, he should draw cards until the amount of point will reach 17 or more. Double. After receiving first two cards gambler has an opportunity to win the game with the help of doubling the bet by taking a third card. Split. If firs two cards has equal value, for example 5 and 5 or 10 and 10, player has a chance to divide these cards on two separate hands, making additional bet that is the same as the first one. Insurance gives a gambler a chance to protect from dealer's blackjack by making second bet that costs half as much again first one. Surrender. It may happen that player's cards are unfortunate. In this case it is possible to refuse from playing the game, losing half of bet. Looking at the fact, that Blackjack is quite understandable and interesting game, it has more and more success among gamblers than any other game. It is, perhaps, the only game, where result depends not only on good luck, but also on knowledge and skills.